Why Do My Fingers Hurt After Swimming? Swimming offers a myriad of health benefits, including lower blood pressure, weight control, improvements in muscle tone and even a reduced risk of depression. No one wants to come out of the water feeling worse than when they got in. But your fingers are just like any other part of your body, leaving them vulnerable to muscle pain and injuries. The most obvious cause of finger pain after a swim is injury to the muscles in your hands, wrists and fingers. You might not give these muscles much thought, but they're still there. Overstretching your hand, moving your hands in strange angles or having weak and overworked muscles can all lead to strains and sprains. If you keep your hands rigid and stretched when you swim, for example, you can strain the muscles. Impact injuries can also cause pain. If you overextend your finger putting your hand on the bottom of the pool, you could end up with a sprain, and swimming so close to the wall that you hit your finger could lead to injuries ranging from minor swelling to a broken finger. Delayed-onset muscle soreness is muscle pain, usually caused by exercise, that typically happens 12 to 24 hours after a workout. The American College of Sports Medicine reports that most experts believe that tiny injuries and tears in your muscles cause the pain. Consequently, a long swimming routine or a particularly challenging routine can increase your odds of DOMS. 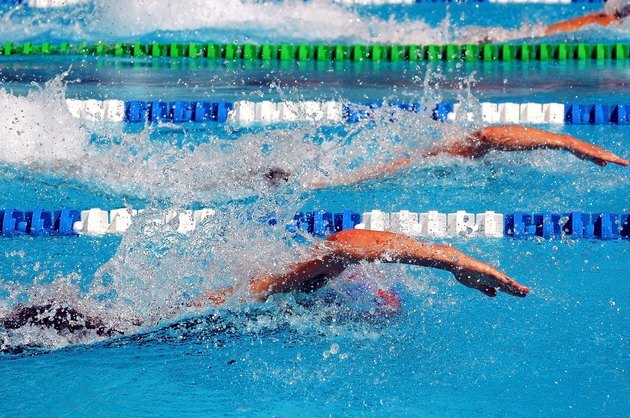 If you're a relatively new swimmer or try a new stroke such as the breast stroke or freestyle stroke, your muscles aren't used to the motion and you're more likely to develop pain. DOMS isn't dangerous, but the American College of Sports Medicine advises limiting your physical activity until the pain subsides. Not all pain is muscular. When you swim in a treated pool, you're exposed to a variety of chemicals, most notably chlorine. If you have sensitive skin, allergies or eczema, your fingers may end up sore, and this soreness can be exacerbated by small scrapes from bumping the side or bottom of the pool. If the pain gets worse or your hands become swollen, itchy or red, talk to your doctor. Proper hand position can help you reduce your risk of finger pain. Keep your fingers slightly separated as you swim. This can slow you down a bit, but reduces tension on your fingers -- making this hand position ideal if you struggle with pain. Avoid stiffening your wrists or fingers. Instead, they should flow through the water because locking your joints reduces blood flow and makes your hands and fingers more vulnerable to injuries. If you're concerned that you have weak hands, try grip strength exercises, which can strengthen your hand muscles.